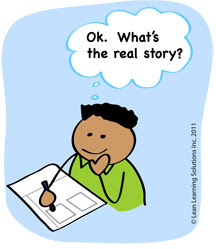 Seems Getting the Right Things Done has been helpful in teaching A3 Thinking, the "story-telling" approach to strategy. I'm gratified by all the good people who've told me, "That book really helped us – thanks!" We're hard-wired to tell stories -- that's what our ancestors on the African savannah did at day's end around the fire. "And what happens next?" you wonder. Where do images fit in? Here's an assignment for folks that have gained proficiency developing A3s. Turn your A3 over – now draw a picture that tells the story. Don't worry if you "can't draw" – stick figures, circles and arrows are all you need. Now tell the story to your team through the image. The better your understanding of the problem, the easier this'll be – and the clearer your image. We've tried to illustrate Lean Thinking, Tools and Leadership with our Brain Booster pocket cards and apps. I like this idea allot. Thanks for sharing this idea. I think I will propose this approach in our business. Visual thinking helps clarify & simplify.